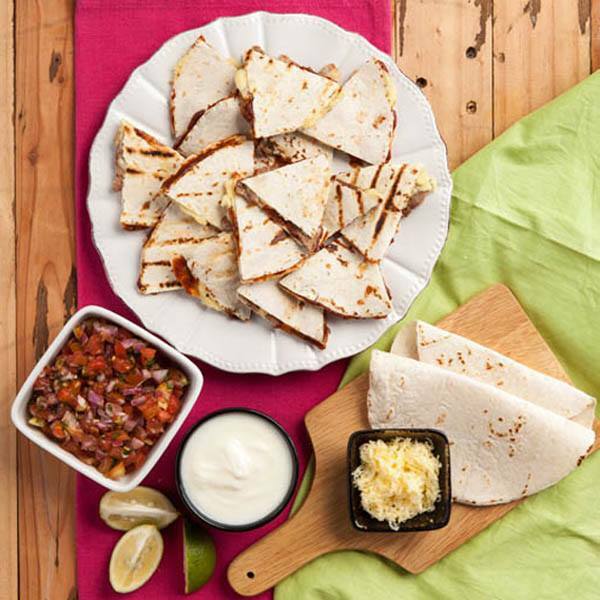 It’s quick and easy to whip up a platter of 100% Sure-Sarap Quesadillas! Check this recipe out made with Del Monte Quick n Easy Pizza Sauce. 1. Season the beef with salt and pepper. 2. Pan grill the beef then brush with butter when cooked. Set aside. 3. To make the salsa, mix all ingredients in a bowl then set aside. 4. Spread the pizza sauce onto the flour tortilla. 5. Add the sliced beef, salsa and cheese. Top with another piece of flour tortilla. 6. Heat a dry pan and put the sandwiched tortillas. Then heat both sides so the cheese will melt. 7. Serve with sour cream.